It is now all put together. 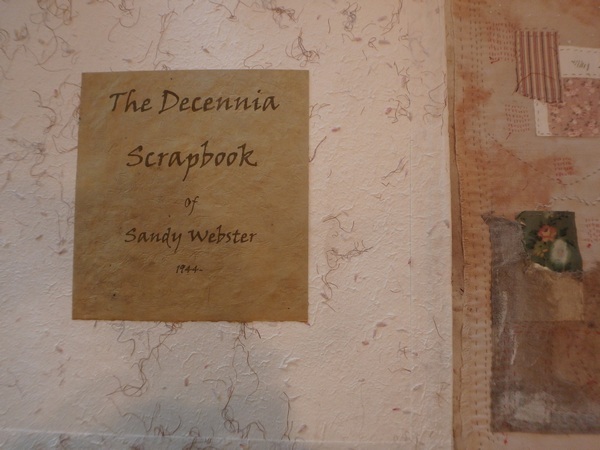 The Decennia Scrapbook. The size is 20″ x 22″ x 1″. 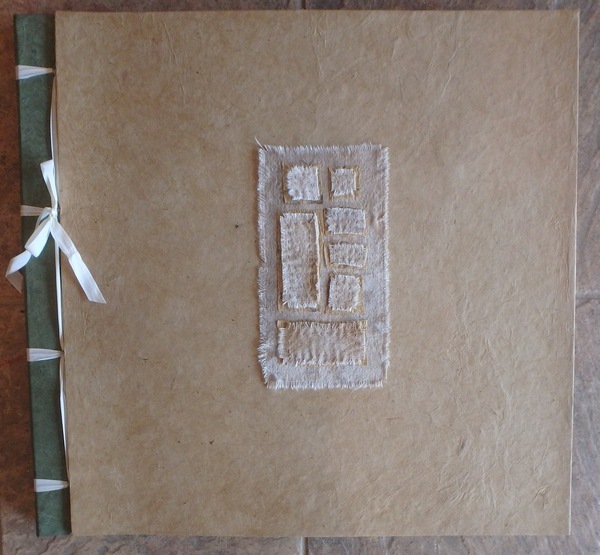 Hard bound with a Toji or stab binding. It is my life in decades as I remember them. 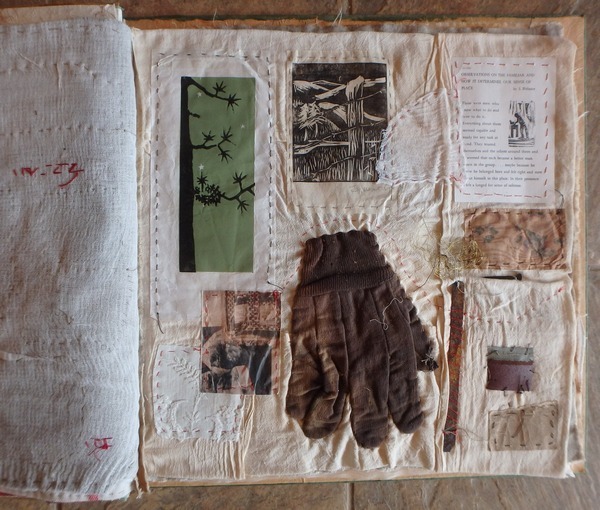 They are memories fixed to a cloth that was cut or torn to 18″ x 18″ and then stitched through to hold the small bits and pieces that represent a recollection of a time or incidence of importance. Here is the inside cover with title and part of the page of my first ten years. I did not like the word “decade”. It sounds hard or harsh is more like it. So I looked up synonyms for that word and came up with “decennium”. Now that sounded better. The plural could be just add an “s” or use the one I chose, decennia. My spell check still does not like it, but I do. 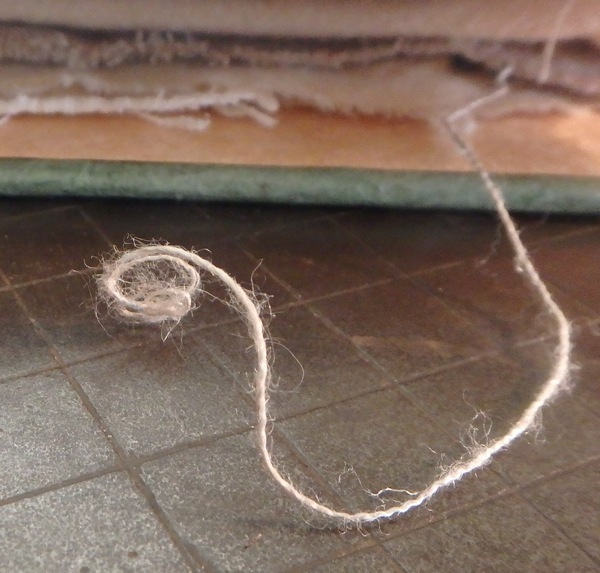 I sewed by hand each single cloth page to one side of a narrow cloth folio that would be the unseen part inside the toji binding stitches. After those were stacked up and lightly glued in place I could tell how large the board covers would have to be cut….19.5 x 21.25. And after filling the narrow spine folios with spare thin strips of board, I could estimate the depth the spine board would have to be. Now for the laying out. Of course there is no lokta paper large enough to do all the cover sections at one go, so then it was picking out separate papers that came the closest to the scrapbook I had as a young girl. Mine was green, the construction paper pages were a cream color. It was bound like the early photo albums….a strong lacing between two holes in a section of the front cover on the extreme left. This allowed the front cover to be flipped open where it would lay flat. Next figure out how much paper I had to go over the back full size cover of 21.25 inches, leave a space, one inch spine piece, and finally the piece that would come over to the cover and hold the folios firm. There was only a few inches to spare on the end and the top and bottom sides barely reached over to the inside when I glued them down with a good stretchy mixture of corn starch paste and PVA glue. When all stacked and held in place, I used the drill to make the holes in four places along the seam of front cover and side panel. The cover had to be decided on. At first I wanted the title on the outside cover. Bad idea. The font I wanted was hard to make a pattern of and cut out. But typical of how I work, that is not evident until it is all finished on another piece of paper (complete with some stitching) that I had hoped to glue to the cover. Not good….bit tacky actually. 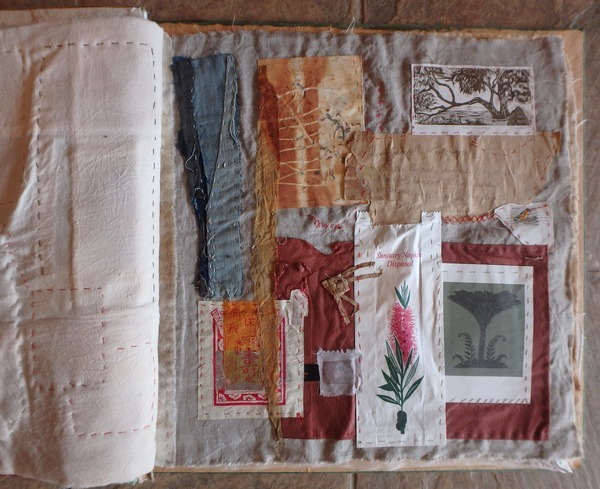 So I decided to use some of the dyed scraps from the narrow folios and stitch them to papers approximately their same size with the most often used thread from inside the book. Then glue those to another piece of the same cloth. Here is where that cloth came from. 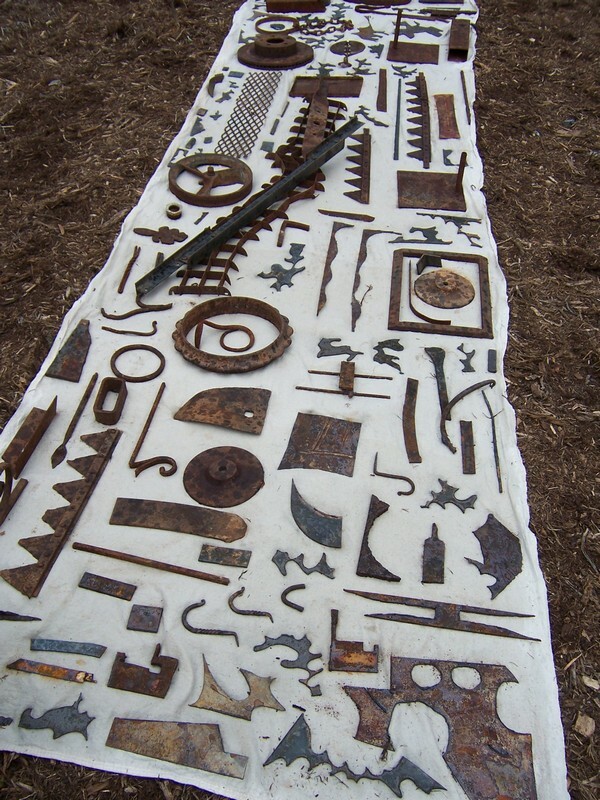 A cotton drop cloth colored with rusty bits, etc in the yard a few years ago. 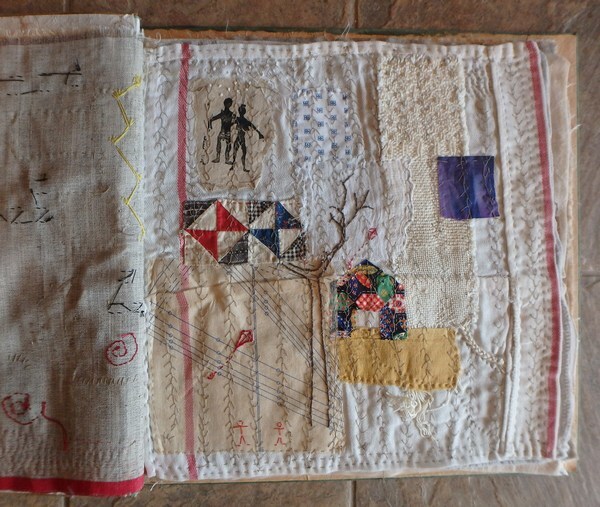 I have got a lot of mileage from this drop cloth and will be using this technique in my class next week at the John C Campbell Folk School class called, “Making Pages, Making Books, Making Art”. Anyway scraps of this cloth and other ones using those hardware drop cloths have been pretty handy. The cloth frays nicely and feels good in the hand. I’d make clothes out of it if it wouldn’t make me look like I was washed up somewhere. Back to the scrapbook. Here is the 20 – 30 year page. I like this one. Married, mother, housewife setting up housekeeping and immersing myself totally into all that that implies. On a bit of an aside, when I was seeing if I qualified for social security about ten or twelve years ago, the lovely woman across the desk told me that I certainly did. I did not have to have a dead husband to receive a percentage of what he had paid in. She said I had earned it by being there taking care of everything on the home front. She smiled and told me they called women like me “dinosaurs” because we were dying out. After my time, most women had to have jobs to make ends meet. And of course most of those women of my era who sought careers were trained as teachers or nurses. And the training for those cost money not available. So here I am on this page of 20 -30 years of age. I like how the behind the scenes stitching of my adolescent years informs a bit of this page. And how about that dishtowel? Is there anything that says “housewife” like a dishtowel? And another favorite page. Thinking of myself as an artist with things to say and the move south. Going back to college and settling in to just being immersed in a new but familiar place. And another favorite. The one after this. The start of travel and a very long love affair with Australia. I love how these pages flop over to the left, how you can’t help but touch all the parts, how they make noise of rustling paper, how soft they feel, how they make me smile. And how even closed there is is a bit of memory escaping out the side. Tucking it back in gives me another look at who I was before I got here. I even put in a blank page of very thin silk in case I make it into the ninth decade….80 -90. Who knows? I might need someone to thread my needle for me but I am quite sure I will have things to remember and put on the page. As you can see by the pages shown here, the quality of stitches is of little importance so that won’t be a problem later either.